I started writing this post when I first tested the below recipe. 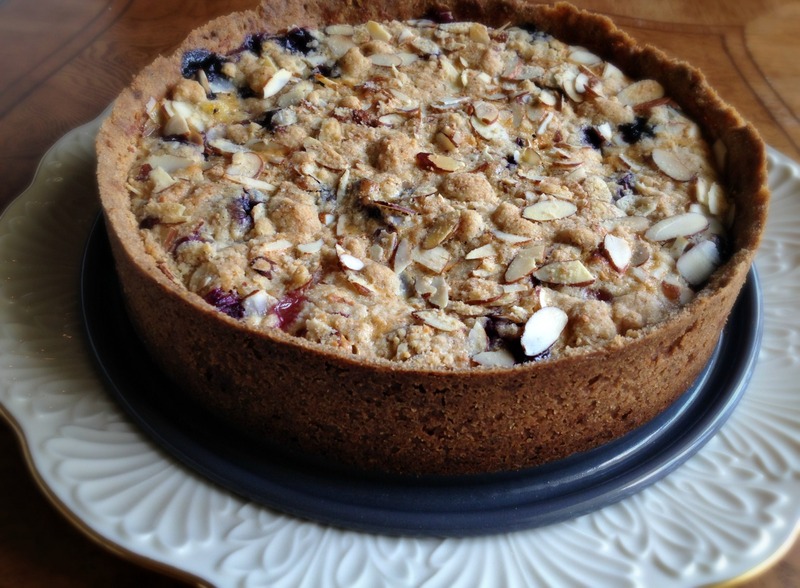 At the time I was making an apricot-cherry crumb tart. But before the final test, I read this piece from Francis Lam and nodded my way along. While much of it is about his experience as the son of immigrants, grappling with American culture and identity; the way Lam talks about writing, relationships with people, relationships with food, hits at why I do this. Writing about food is a way to converse, to belong — whatever “belonging” means to you. I’ve always hated the word “community” for some reason. It seems too hokey. But writing about food and putting it out there does, I guess, creates a certain kind of community. It’s a way to learn about people through their favorite foods, their cooking habits, the way they make something universal like rice, or how they think about produce. There are plenty of people who don’t cook or bake, who don’t read through cookbooks with eyes wide as a childens’; but there are very few who don’t appreciate food in some way or who don’t have a food memory or two. But that’s also the curse of this “gig” — that feeling of knowing someone without actually knowing him or her. It would be a shame if someone read my posts and defined me solely by those words or my directionless banter. They’d probably get that I’m slightly compulsive (ok, very compulsive); passionate about baking first, cooking second (a very close second). That’s fine, because it’s all true. But my writing style and the recipes I share do not necessarily allude to the fact that I can be absurdly silly, that I am a music lover, and that I actually do other things than make food and write about it (although, admittedly, that covers a lot). Yes, there is more at the core if you dig. Like these apricots. And yes, fruit inspired my post today; I guess food really does move me. Stone fruits have always spoken to me. Apricots, especially, like people, are curious little things. At their best, they are small and deeply orange with an embarrassed patch of blush. When they reach that perfect point of sweet-tart, they are squishy soft, but not mushy. They’re juicy but not as difficult to consume in an office setting as a peach or a nectarine. If you look a little deeper though, you can get at the apricot’s core — its true self, its true personality. At its core rests a free-moving almond-flavored pit, no, kernel actually. Its delicious flesh serves as a juicy protective layer to that fragrant, complex center that permeates the fruit. I usually enjoy them alone or in jam. Even plain they still give you something to think about; they’re layers of flavor deep. 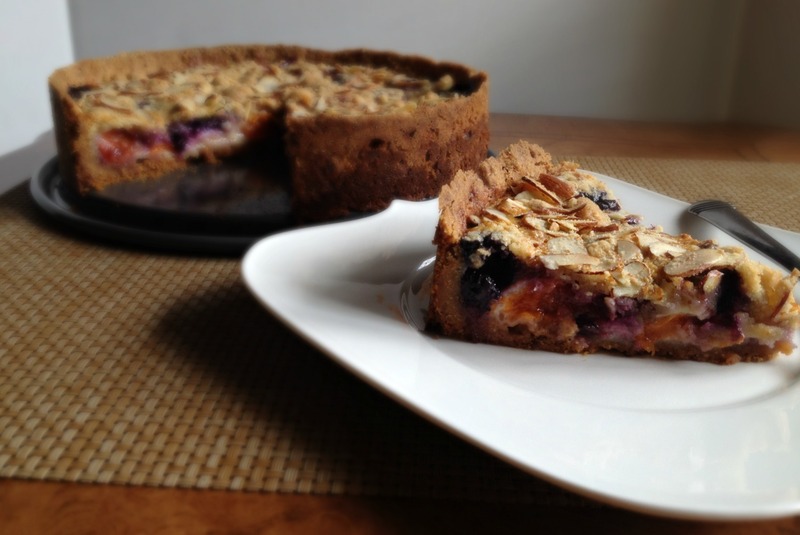 But this time, I thought I would take this very appealing-looking Raspberry-Plum Crumb Tart that I’ve seen made before with its original ingredients — plums, a cinnamon-spiked custard, and a thick, rustic, hazelnut crust and crumble — and adapt it to my beloved apricots. To play on that which is within, I tried to get almond flavor in here three ways. The crust incorporates ground almonds instead of hazelnuts, the custard has a sparing splash of almond extract, and the top crumb is mixed with slivered almonds that get wonderfully toasty in the oven. And to add another fruit, some more color, I tossed in some seasonal blueberries; they’re just pure sweet, so they counteract the tartness of the apricots. And they also have a natural place in almond-flavored desserts. 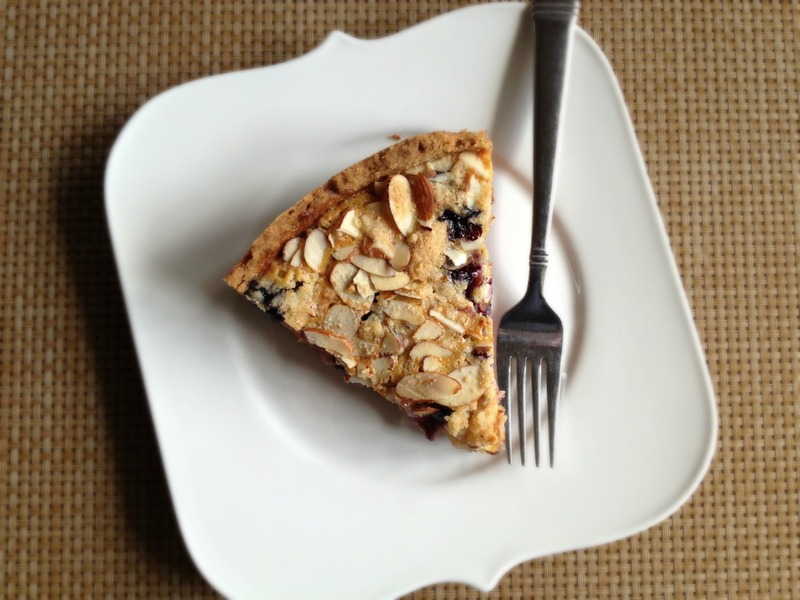 What you get is a warm, buttery crust, perfumed with the natural aroma of toasted nuts. The custard holds the fruit together and heightens the apricot’s floral almond flavor. Blueberries pop beautifully and bubble a little out of the thick cobblestone top. Each bite is bright, and the perfect study in texture. It’s the perfect way to use summer’s finest. The best desserts come from studying the core of their ingredients. Like I said, I started using cherries and apricots. While delicious — cherry pits are also almond flavored — they made for a clunkier bite. I cannot say that you can substitute any berry or stone fruit here. Peaches, nectarines are too juicy, and the custard will never set. Raspberries are too tart to offset the apricot, the main source of tartness here; strawberries are too watery; blackberries are too big. I usually check the progress of custard tarts with a thermometer for foolproof results. That won’t work here; you’ll hit fruit pockets, and the sugary juices will register much higher than the egg custard itself. Go with your better judgement, follow the recipe time, and be sure not to overcook. There’s nothing worse than curdled custard. Butter a 9-inch springform pan; set aside. Spread whole almonds on a baking sheet and roast until fragrant, about 10 minutes. Let cool. Place nuts in the bowl of a food processor, and pulse until medium fine, about 30-40 pulses. Some texture is good. Transfer nuts to the bowl of a stand mixer fitted with the paddle attachment. Add flour, granulated sugar, light-brown sugar (break it up with your fingers as you add it), and salt; mix on low speed to combine. Add butter, and mix until crumb begins to stick together, 2 to 3 minutes. Press 3 cups of crumb into the bottom of the prepared pan and about 1 1/2 inches up the sides of the pan to form crust. Place remaining crumb mixture in the refrigerator. Transfer crust to the oven; bake for 15 minutes. It will puff up. Press the crust gently with the bottom of a measuring cup. Brush on a thin layer of egg white on the bottom and up the sides of the crust. Bake for 3-5 more minutes, until it appears to be set. Place on a wire rack to cool. Slice apricots in half, and remove kernels. Slice each half into quarters. 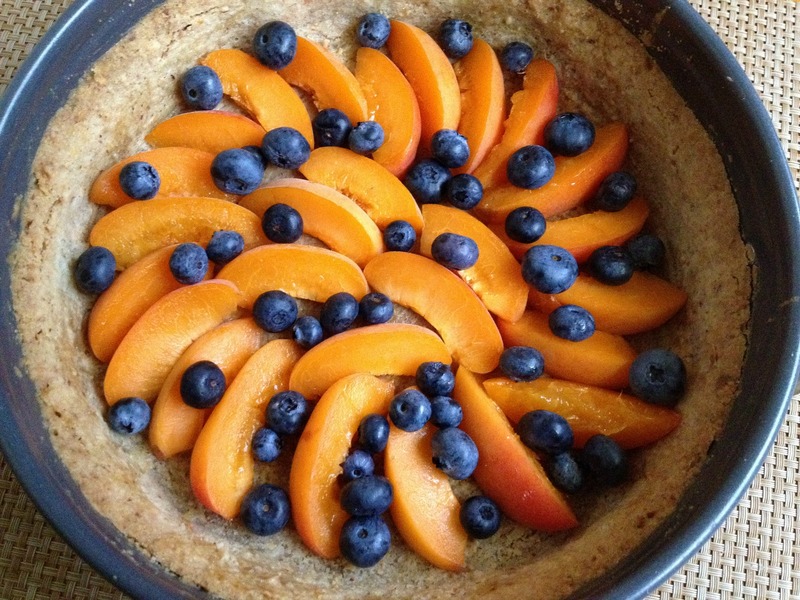 Scatter apricots and blueberries evenly onto cooled crust; set aside. Remove crumbs from the refrigerator and toss with slivered almonds. In a medium bowl, whisk together flour and granulated sugar. Whisk in egg, egg yolk, heavy cream, milk, almond extract, and salt. Pour custard over fruit; sprinkle with crumb mixture. Transfer tart to the oven; bake until custard has set and is slightly golden, 45 to 50 minutes. Let rest at least 25 minutes before cutting. Serve warm, room temperature, or chilled. I have been formulating a blog post in my head about a similar subject, about food bringing us together. Not always as a community, but you find often that people have some memory of food at family events, important scenes in their lives, etc. This looks just lovely and I’m amazed at how beautifully you’ve arranged those slices. Lovely post. And what a beautiful tart! Related to what you said about everyone having at least some fond food memory, one of my favorite parts of writing my blog has been connecting with people I’d somewhat lost touch with because they were able to connect with me again on the topic of food. Definitely not everyone gets excited about it, but I love that feeling when someone gets excited about the same thing you do. I love this post. I think it gives deeper insight into your personality. 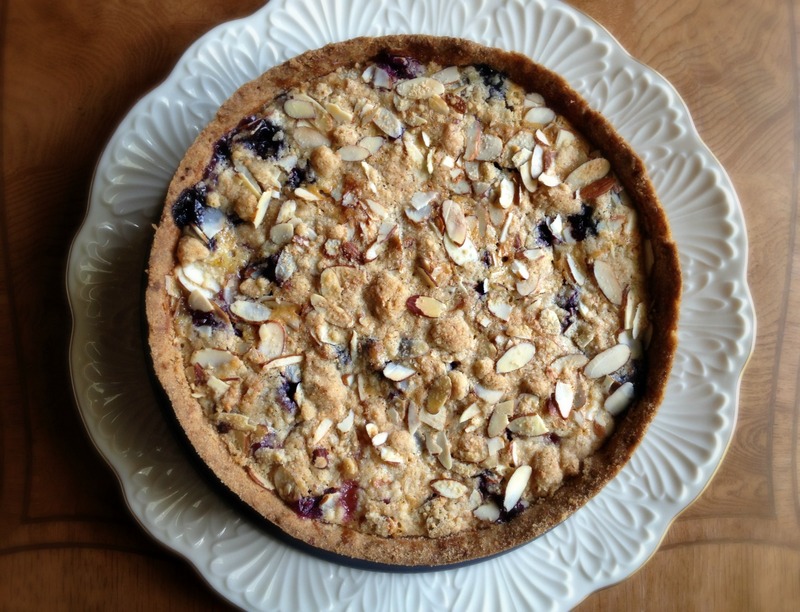 And this tart looks absolutely incredible. I love how it’s more of a deep-dish tart. Lovely post, Sacha. I love stopping by your blog and reading what you have to say.